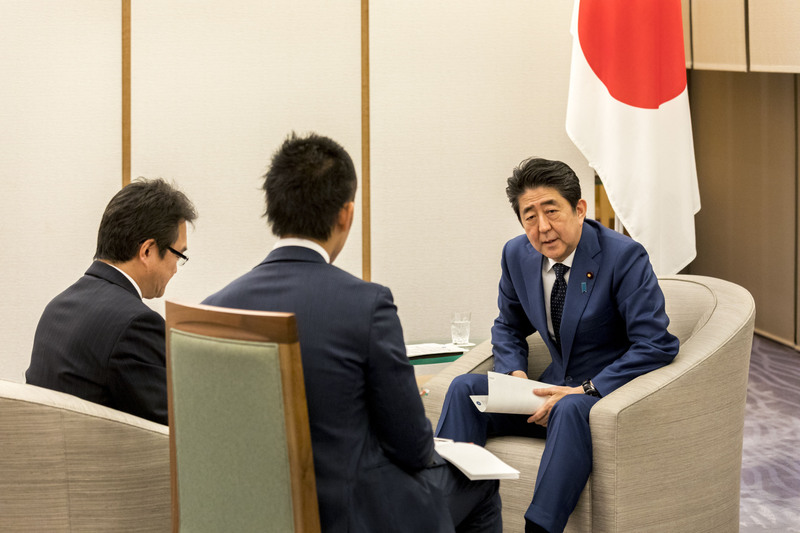 Prime Minister Shinzo Abe has voiced reluctance to compromise on the substance of constitutional amendments, emphasizing his commitment to the ambitious goal of altering the war-renouncing Article 9 and its perceived incompatibility with the Self-Defense Forces. 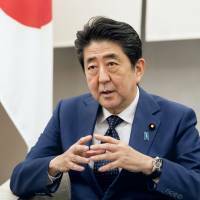 In an exclusive interview with The Japan Times on Friday, Abe also stressed that his avenue for dialogue with South Korea and China “remains always open” as he seeks to straighten out historical and territorial rows complicating Japan’s ties with its neighbors. The prime minister surprised the nation in May last year when he announced he wanted to legitimize the SDF by adding a fresh paragraph to Article 9 to acknowledge its existence in the charter, thereby putting an end to scholarly disagreements about its legality. 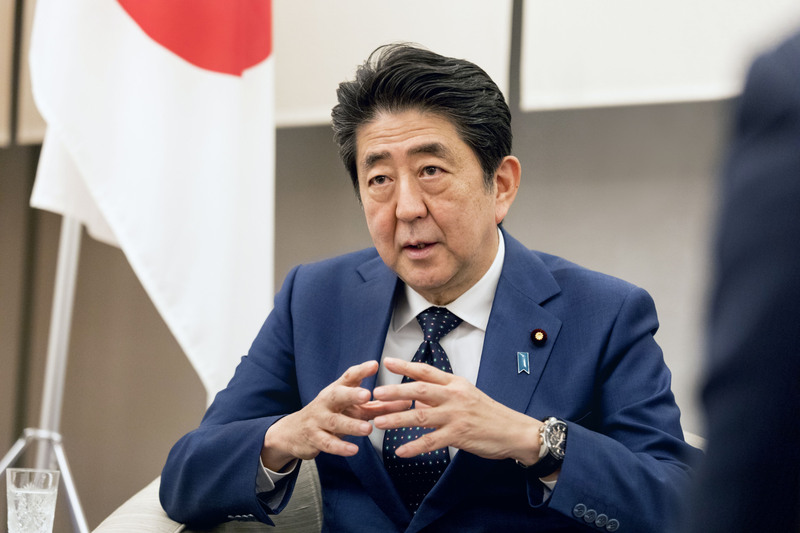 As he sat down with The Japan Times at the Prime Minister’s Office on Friday, Abe took a dim view of revising the Constitution for revision’s sake. 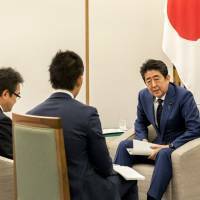 “The reason I went so far as to make such a proposal in May was due to the belief that having the Constitution codify the SDF, which plays a central role in protecting Japan’s safety and the lives of its people, has been the purpose of the Liberal Democratic Party since its foundation,” said Abe, who doubles as head of the party. 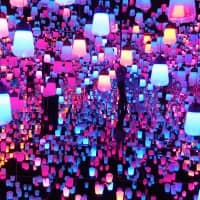 “So abandoning this goal just because it’s difficult to achieve and opting for a different, easier amendment option, I think, would only make us sound less convincing,” he said. Article 9 is considered riskier to tackle than the other articles because of the integral role it plays in defining Japan’s pacifist identity. Failure to win the majority vote needed to pass a national referendum on revision would take a devastating toll on Abe and probably force him to resign, experts say. On Friday, Abe insisted his way of tackling Article 9 “would in no way change” Japan’s postwar identity. This denial echoed Abe’s assertion in the Diet last week. As he spoke to the Lower House Budget Committee, Abe attempted to drum up support for his proposal by assuring the Diet that his approach, unlike the LDP’s 2012 amendment proposal, would not result in the SDF being allowed to exercise the right to collective self-defense — which refers to coming to the aid of an ally even when Japan itself is not under attack — any more than it is partially permitted to do at the moment under the two divisive security laws circumventing Article 9 that took effect in March 2016. The 98th prime minister is at a crossroads in his constitutional revision quest this year as he weighs whether to initiate Japan’s first referendum on the issue — a prerequisite for revision — to meet his self-imposed deadline of achieving revision by 2020. But challenges lie ahead, including a sharply divided public. A recent Kyodo News poll showed that 54.8 percent of respondents opposed amending Article 9 under Abe. 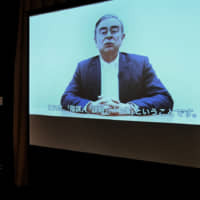 Even Abe’s own party isn’t completely on board with his strategy, with hawkish members such as former Defense Minister Shigeru Ishiba adamant that the LDP needs to stick to the policy it set in 2012. 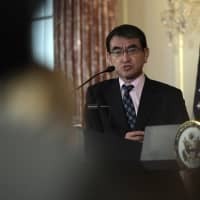 Still, with his ruling coalition and its allies controlling the two-thirds supermajority needed to initiate a referendum in both houses of the Diet, “it’s now possible for us to actually call a referendum,” Abe said. “The SDF personnel risk their lives to achieve their mission in the event of a natural disaster … But many children grow up reading textbooks saying they may be unconstitutional,” Abe said with chagrin. As he faces the daunting task of improving relations with China and South Korea, Abe stressed his commitment to open-minded diplomacy. 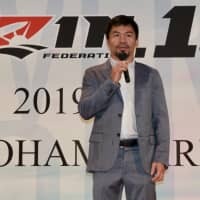 At the risk of antagonizing his conservative support base, Abe revealed his intention last month to attend the opening ceremony of the Winter Olympics in Pyeongchang on Friday. Abe’s announcement put an end to weekslong speculation that he might boycott the Feb. 9 ceremony due to a recent feud with Seoul over the comfort women issue. In the interview, he added that he will seek to make Moon understand public sentiment here concerning Seoul’s flip-flop. As this year marks the 40th anniversary of the peace and friendship treaty between Japan and China, Abe said he wants to work toward a “significant improvement” in Japan-China relations by boosting economic cooperation and promoting national exchange activities. Japan’s ties with China have remained rather tense over the years due in part to the nationalization in 2012 of the Senkaku Islands in the East China Sea and Abe’s visit in 2013 to the war-linked Yasukuni Shrine. Just last month, tensions over the territorial dispute flared anew when a frigate and a submarine from China separately entered the contiguous waters off the islets, which are claimed as Diaoyu by China and Tiaoyutai by Taiwan, prompting the Foreign Ministry to lodge a stern protest. But at a time when Beijing’s decisive commitment to reining in North Korea’s saber-rattling is deemed more necessary than ever, “building good relationships is the responsibility of the leaders of both Japan and China,” Abe said. 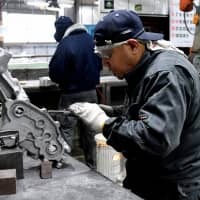 The longevity of his administration and his stable international presence have helped Japan halt its high turnover rate in prime ministers, including his own short-lived first stint in power from 2006 to 2007 that saw him bow out in humiliation over health issues. 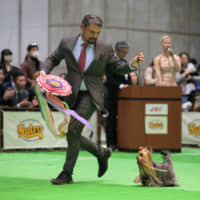 Today, a reinvigorated Abe boasts one of the firmest grips on power Japan has seen in recent memory, with his candidacy for the LDP leadership election in September widely taken for granted. Another victory would extend his term as LDP president — and therefore as prime minister — until September 2021, putting him on course to become the nation’s longest-serving prime minister ever. 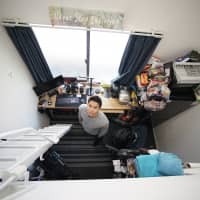 “When I returned to office, the world was largely resigned to the idea that Japan, plagued by a shrinking population, won’t be able to grow anymore,” Abe said.